Simon & Schuster, 9781501106293, 480pp. The remarkable story of the trailblazers and the ordinary Americans on the front lines of the epic mission to reach the moon. President John F. Kennedy astonished the world on May 25, 1961, when he announced to Congress that the United States should land a man on the Moon by 1970. No group was more surprised than the scientists and engineers at NASA, who suddenly had less than a decade to invent space travel. When Kennedy announced that goal, no one knew how to navigate to the Moon. No one knew how to build a rocket big enough to reach the Moon, or how to build a computer small enough (and powerful enough) to fly a spaceship there. No one knew what the surface of the Moon was like, or what astronauts could eat as they flew there. On the day of Kennedy’s historic speech, America had a total of fifteen minutes of spaceflight experience—with just five of those minutes outside the atmosphere. Russian dogs had more time in space than U.S. astronauts. Over the next decade, more than 400,000 scientists, engineers, and factory workers would send 24 astronauts to the Moon. Each hour of space flight would require one million hours of work back on Earth to get America to the Moon on July 20, 1969. Fifty years later, One Giant Leap is the sweeping, definitive behind-the-scenes account of the furious race to complete one of mankind’s greatest achievements. It’s a story filled with surprises—from the item the astronauts almost forgot to take with them (the American flag), to the extraordinary impact Apollo would have back on Earth, and on the way we live today. Charles Fishman introduces readers to the men and women who had to solve 10,000 problems before astronauts could reach the Moon. From the research labs of MIT, where the eccentric and legendary pioneer Charles Draper created the tools to fly the Apollo spaceships, to the factories where dozens of women sewed spacesuits, parachutes, and even computer hardware by hand, Fishman captures the exceptional feats of these ordinary Americans. 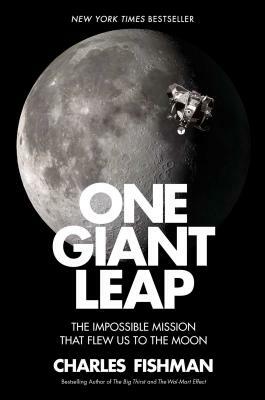 One Giant Leap is the captivating story of men and women charged with changing the world as we knew it—their leaders, their triumphs, their near disasters, all of which led to arguably the greatest success story, and the greatest adventure story, of the twentieth century.